We are leaving in the morning to fly east. My sister is getting MARRIED! And we're making a vacation of it; spending time in Boston before heading out Cape Cod for the festivities. But to distract myself from our inability to pack light (that'll be another post), I'm going to write about donuts. And how Denver is still failing on that front. Ok. Failing is a blatant overstatement. The multiple donut establishments in the area are providing totally servicable donuts. But no one is hitting it out of the ballpark. New places keep opening but they are not satisfying my intense need for a donut exactly like one from Seattle's Mighty-O (Side note: It expanded recently! In Ballard now! And Capitol Hill!). Solid yeasted donuts. The dough was the right amount of puffy and held its shape when you took a bite. And it wasn't too sweet. Decent varieties. I'm a bit of a purist. I don't want fruit loops on my donut. Don't you dare give me an artificial flavor. I just want some thoughtful flavors with an appropriate amount of sugar. Habit was okay in this regard. They delivered on some, but others were a bit over the top. Whiskey? Huh? They advertise alcohol to go with the donuts. I'm pretty sure that's a silly idea, but even if I were to go with it, I'd expect some high-quality bourbon. But no. They have little plastic shots by the cash register. Not enticing. Free coffee. Habit is right next door to Carbon and both businesses are under the same owner. But they're not really connected. Two different outside doors. 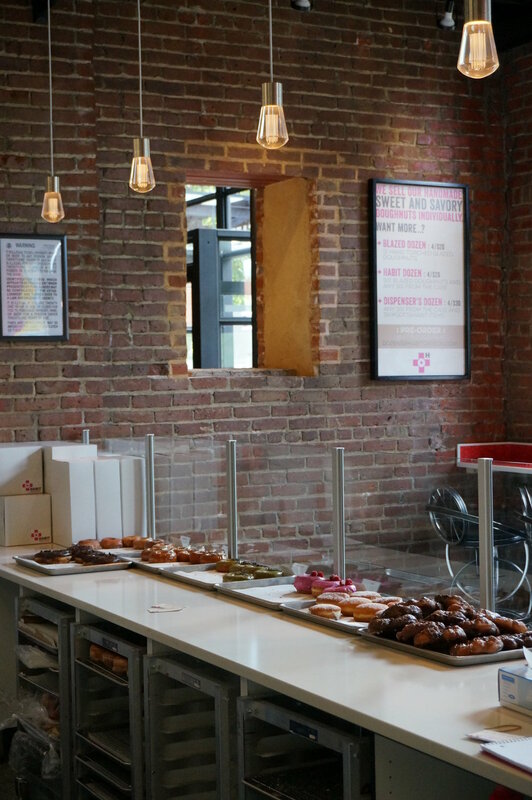 Habit offers free drip coffee when you buy donuts. I've never been to business school, but that seems like a terrible idea. If you weren't giving me free coffee, I'd go buy a $4 latte next door. I would have enjoyed the latte more than the drip coffee too, but I'm a sucker for free things. But now all I remember is bad coffee. Candy store? The also sell other "necessities" like candy and laundry detergent. An interesting concept, but it's not so much corner store-y as it is gimmicky. I just don't imagine they'll sell much of that stuff. But again, I am no business expert so maybe it's me who's missing something. Atmosphere. The space Habit occupies is primo. But they obviously weren't aiming to make it a comfortable café. Most of the space is devoted to baking (I assume?) with just a small counter and limited indoor seating. Even though the donuts were good, it didn't feel like a place I'd want to linger. Can't wait to go donut hunting in Boston! And no, I will not be eating any Dunkin'. I'm surprised you'd even ask.